I am a positive person by nature and I prefer to buy stocks going up but I am starting to see several leading stocks struggle to hold new highs or fail to challenge recent highs. These patterns are familiar and they are suggesting that the recent bounce is the final stage before a possible market decline. A perfect example can be the charts posted of DRYS yesterday. Now, this big decline could take years to materialize so I don’t want to jump the gun and start yelling sell or short sell everything in sight. I trade to catch the mid to long term trends so time is on our side to determine what is happening. I just need to be able to identify the trend (if one exists) and then trade accordingly. It’s a fairly easy method of investing and doesn’t require watching the market every hour of every day. Trending markets are not very common to begin with but certain sectors, industries or markets are always forming some type of trend. I will look to post up examples from former declining markets and will highlight what the charts looked like before those big declines. Now, take a look at the charts of First Solar Inc. (FSLR). 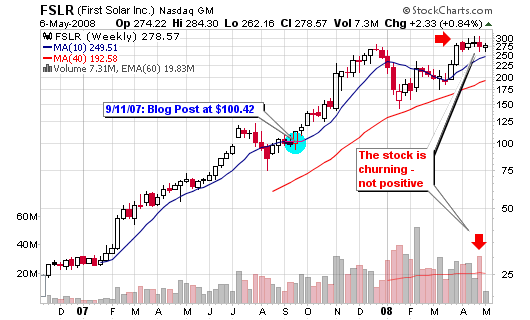 The market leader recently recorded new highs after the first correction since its IPO but it is now starting to churn. We have witnessed three consecutive weeks of churning action as the stock is not moving higher on above average volume. I do admit that the overall trend is still higher but the red flags are starting to appear (with this stock and others). 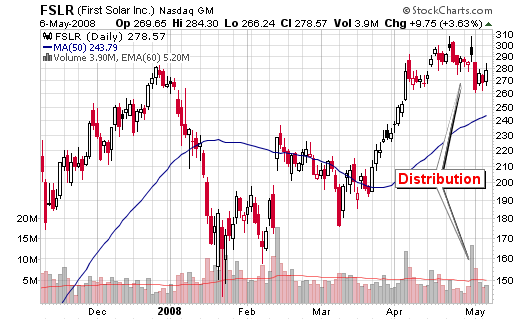 The daily charts shows how the stock reversed from highs on the largest volume in several months, clear distribution. Someone was selling shares last week and they weren’t selling a small lot. Dry Ships was my first example last night and FSLR is my second example of the possible beginning of the end of the recent bull market. Some pundits say the bull ended in late 2007 and early 2008 but this may be the true exhaustion point. 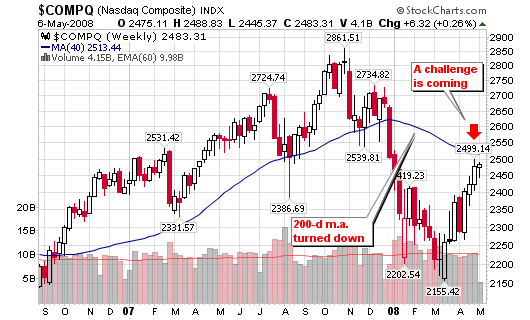 The NASDAQ has a very important task at hand: a challenge of the 40-week or 200-day moving average. This is the first major test of a down-trending 200-day moving average since 2003 or the start of the bull market. The NASDAQ does have several points of support but looking on a multi-year chart shows us that the next drop could be to the psychological support of 2,000 (1,980 area to be specific). After that, the 1,775 area would be the next major long term support. 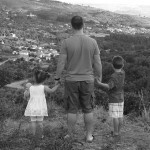 I don’t want to get ahead of myself so let’s continue to focus on the current market leaders. Macro market research is typically a waste of time so that’s the last I will do for a while. What do you make of the decling volume on a weeklt chart of this rally ? would a big volume spike with little price monment start the down-turn if we are in a bear market ? Are the market leaders the First or last to go ? Great job. In DRYS how do you differentiate between churning action and a three weeks tight pattern? this may sound pedantic, but i wanted to understand how you go about defining the market leaders? obviously, there are returns you can look at, but are there other methods you employ to determine which stocks you think lead the market higher/lower? Market leaders are the first to show signs of a trend change. Market laggards don’t show much of anything. The leaders either fail to make new highs on above average volume or stall in new high territory on weak volume – all red flags. Three weeks tight happens without much price change (like railroad tracks) and usually in mid-stream of an uptrend. Volume is typically average. Churning happens near or at new highs on above average volume. The stock typically ends in the lower half of the trading range. Market leaders are stocks making new highs that are also in the highest rated industry groups. Leading stocks also contain the the best relative strength ratings and strong EPS numbers. With oil going through the roof what’s left for stocks to do but go down. This frenzy on oil is driven purely by speculation and FEARMONGERING. Ho Hum, GREED GREED GREED. with US being the #1 in terms of oil consumption, China and India not far behind, you think these prices are pure speculation? Think again. Europe was long ago paying around $8 per gallon, thus $4 a gallon for the US is something shameful to complain about. People are finnally getting was was long due here..$5-7 per gallon. Anything that happens “mid-stream of an uptrend” would appear to be “near or at new highs” when its happening – “mid-stream of an uptrend” by definition can’t be determined till well after the fact. Another of those Canslim-style sell signals that only work in hindsight. I agree with some of what you say but with the profits the oil companies are making, the price of gas does not have to be $4 per gallon. Europe imports more oil per barrel then it produces when compared to the US so it’s not apples-to-apples. I worded the response in a poor way. Three weeks tight does occur near the top when it is happening but moving averages are trending higher and the market is moving higher, not trading below the 200-d m.a. as it is now. I don’t clarify FSLR as a three weeks tight pattern. But then again, technical analysis is not an exact science; it’s based on odds. Some win, some lose. I agree that CANSLIM doesn’t have great sell signals but three weeks tight is a buying strategy from a CANSLIM perspective. My feelings are demand has long been priced in. Speculation and hype is running now. Personally, it brings to mind the tulip bubble of the Netherlands of the 17 century. Granted, oil is far more valuable than tulips but I see the same “fanatical frenzy” going on. Great stuff as usual. Perhaps its time for your superb NH-NL analysis? Long-time since you did that.